When you’re vegan or vegetarian, the one question that you’re asked again and again is “why?” For me, there are three main reasons. Number 1, for your health. 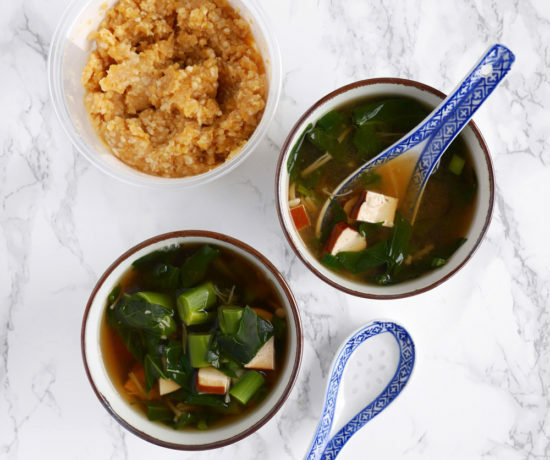 Eating more plants is good for you. Number 2, for the animals. The global meat industry is responsible for the slaughter of 190 million land animals. Every. Single. Day. (source) Obviously, those first two reasons are extremely important, but I would argue that reason number 3, for the environment, is the biggest one of all. It affects every living creature, generations to come, and the planet as a whole. 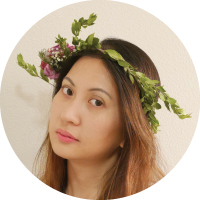 The name of my blog, Let’s Nom Nom, comes from the idea that food brings people together, so let’s bring people together for something meaningful. 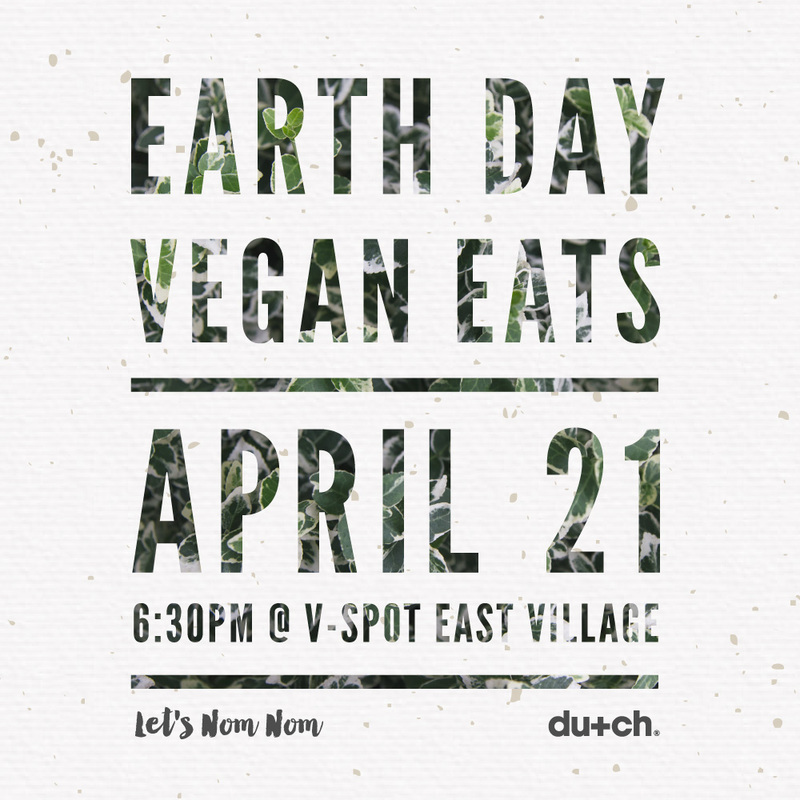 Last week at my Earth Day event, we celebrated great food from local vegan vendors and started a dialogue about veganism and the environment among old friends and new. 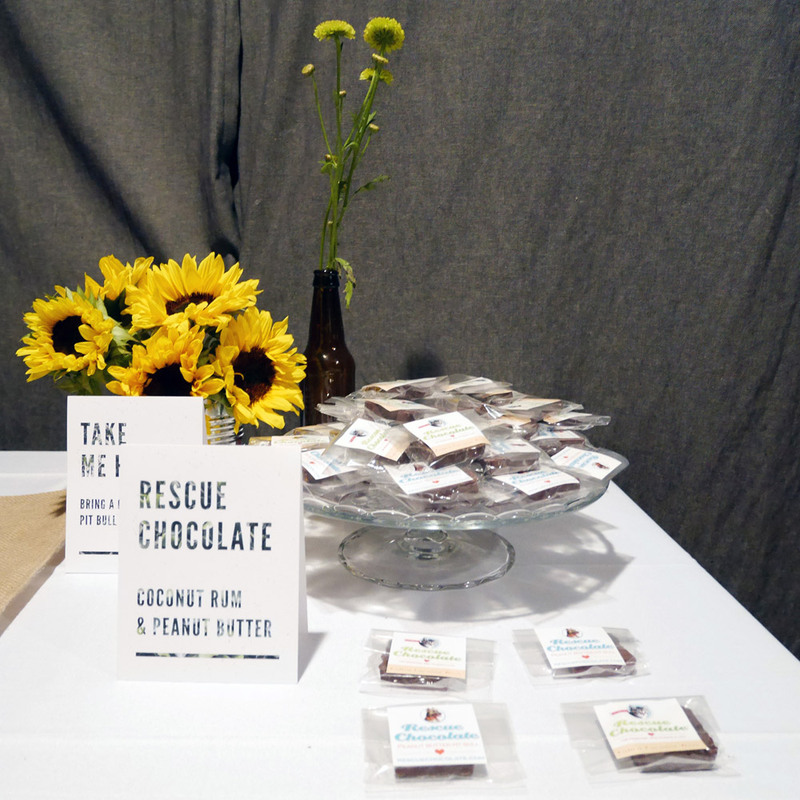 I’ve always been a big believer in design as a driver for positive change, and it was both fun and rewarding to design for an Earth Day vegan tasting event. 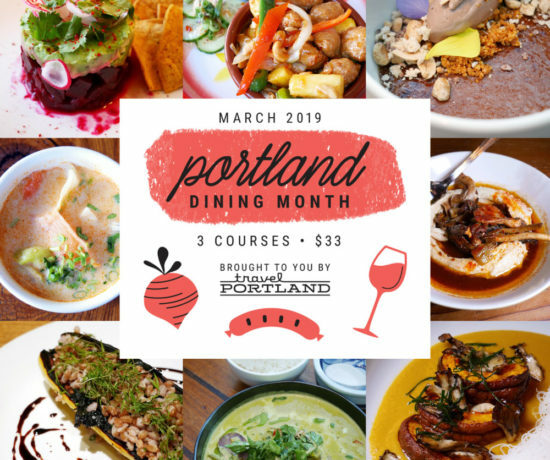 A huge thank you to Let’s Dutch and all our food vendors for being a part of this! Even the photos you see here are a team effort. 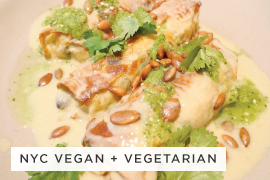 Many thanks to Dishelin Guide and New York City Vegan. There are more photos from other friends scattered across Facebook and Instagram too. 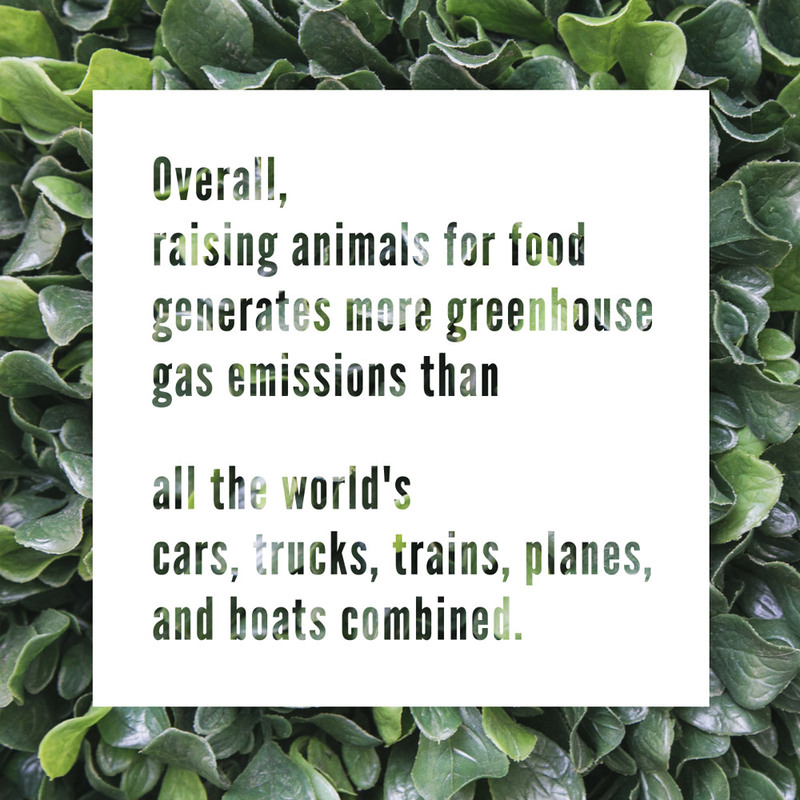 By going vegan for one meal, every guest saved 370 gallons of water, 7 pounds CO2 equivalent greenhouse gas emissions, and 15 pounds of grain (source). I know it sometimes feels like it’s hard for just one person to make a difference, but even switching to one vegan meal a day does help. Remember: it’s not all or nothing. 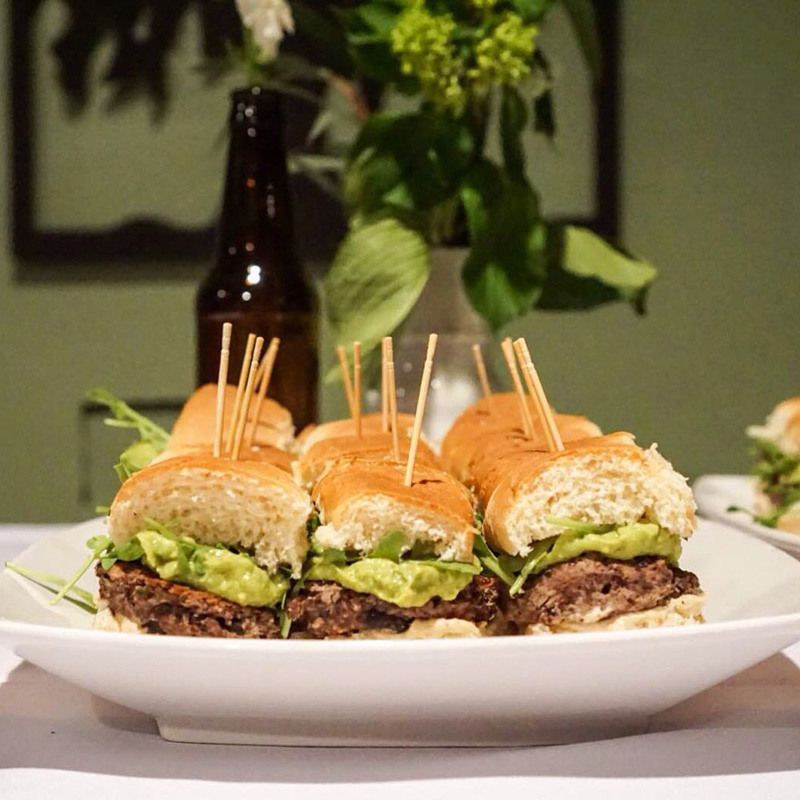 Alas, VSpot Organic’s avocado fries were so popular that I don’t have any photos of them from the event. Perfectly ripe avocado slices, panko fried, served with a spicy vegan mayo. 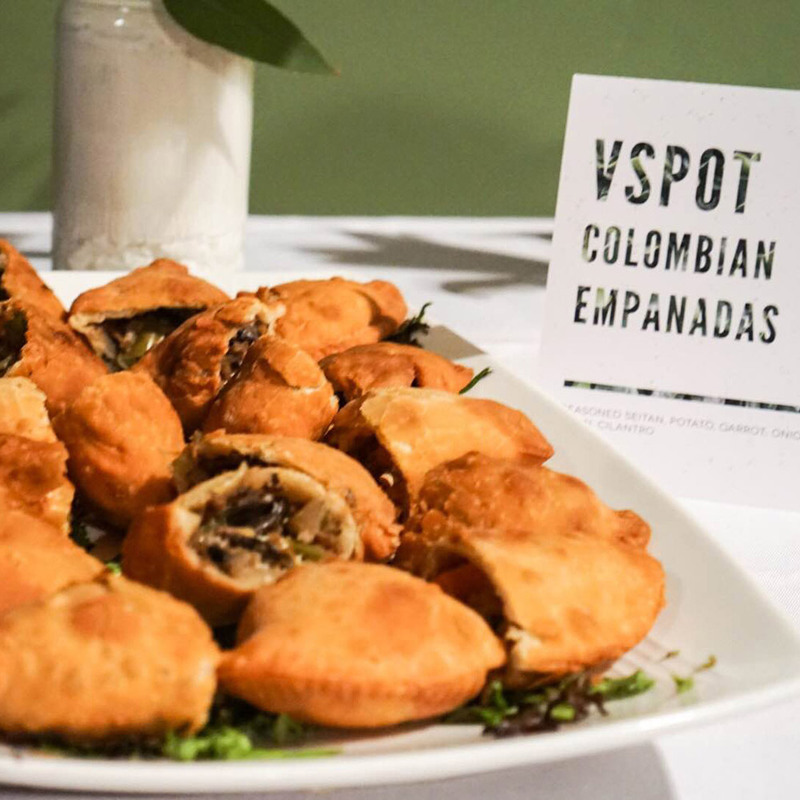 Next, we nibbled on VSpot’s warm, flaky empanadas, which had just earned a spot on a Buzzfeed list the day before. 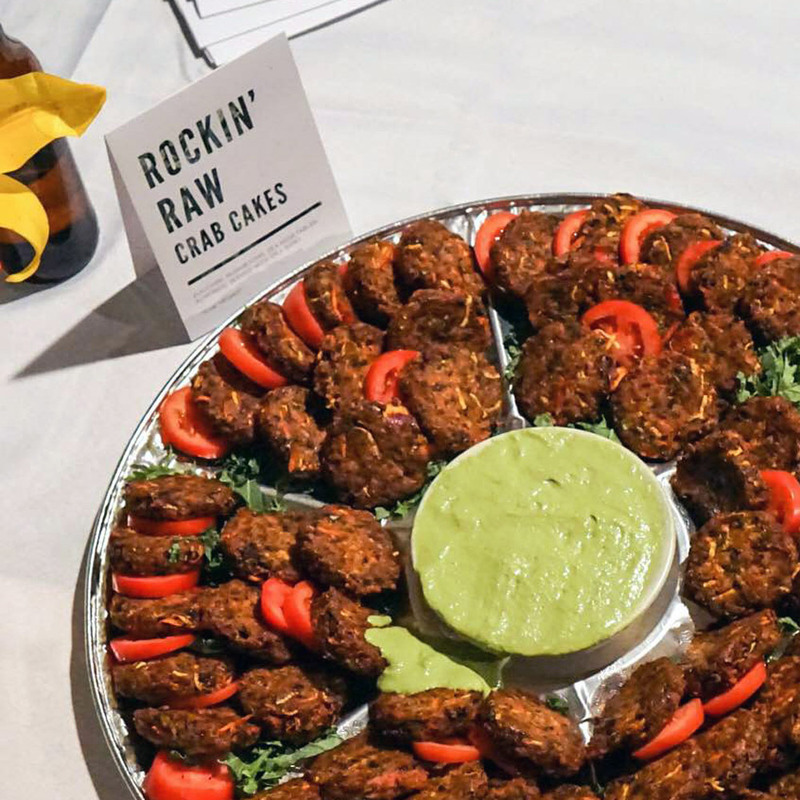 Since there were many veg-curious omnivores attending the event, I wanted to introduce them to the raw vegan, gluten-free goodness from Rockin’ Raw. 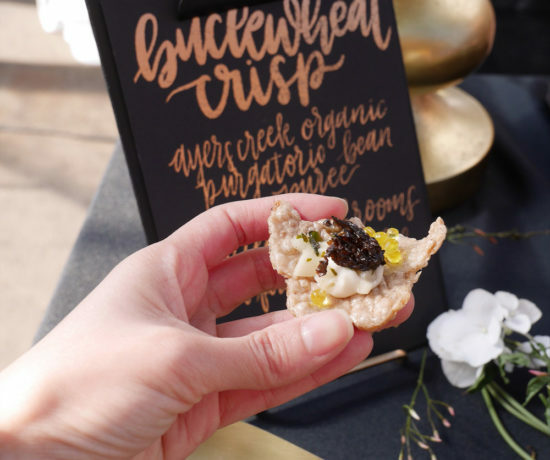 Made of zucchini, mushrooms, sea veggies, and almonds, these bites were a big hit that night! 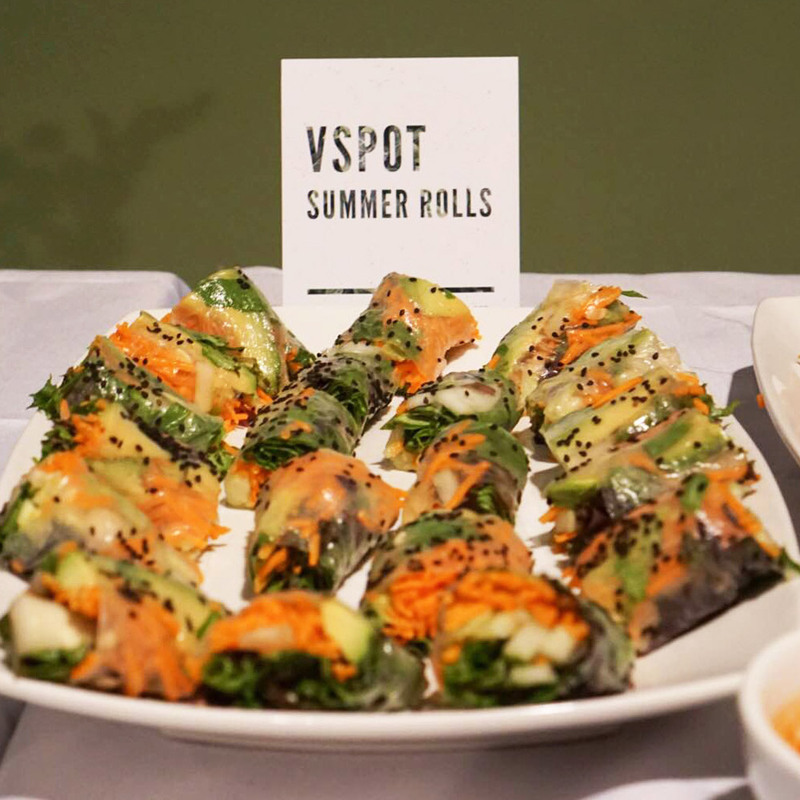 As a healthy palate cleanser, we served VSpot’s fresh and colorful summer rolls. 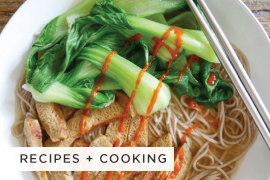 The barely there rice paper wrappers were so light, and the avocado, carrots, cucumbers, and greens were a cheerful reminder that summer is on its way. 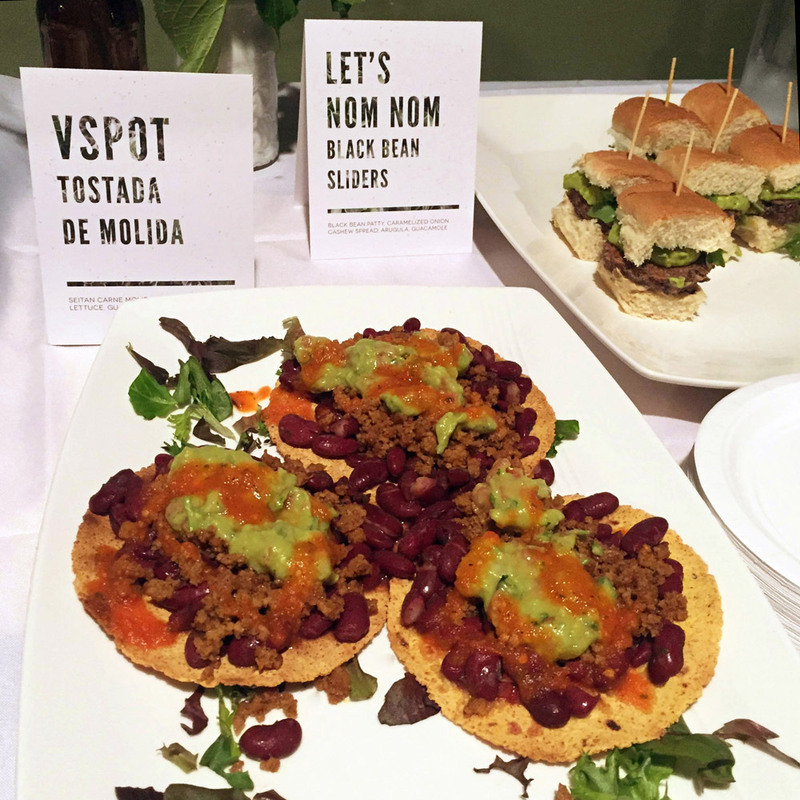 VSpot’s tostada de molida combines juicy seitan carne molida with vegan cheddar, beans, guacamole, and pico de gallo. This veganized Latin classic with a crunchy tortilla may be a bit messy to eat at a cocktail party, but so worth the trouble. 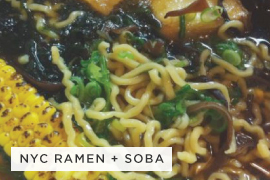 And of course, I featured a dish of my own! During the morning of, I was busy in the kitchen whipping up a batch of my black bean sliders. For some reason, vegan mini slider buns are not easy to come by, so we got creative and cut vegan hot dog buns down to size. Caramelized onion cashew spread, guacamole, and baby arugula were the finishing touches to my homemade black bean patty. It may be made from plants, but it looks pretty darn meaty if you ask me. The vivid green of freshly made guacamole is always so stunning. 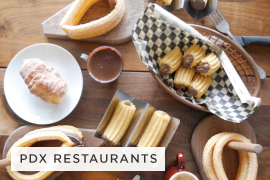 I sure hope everyone saved room for dessert! 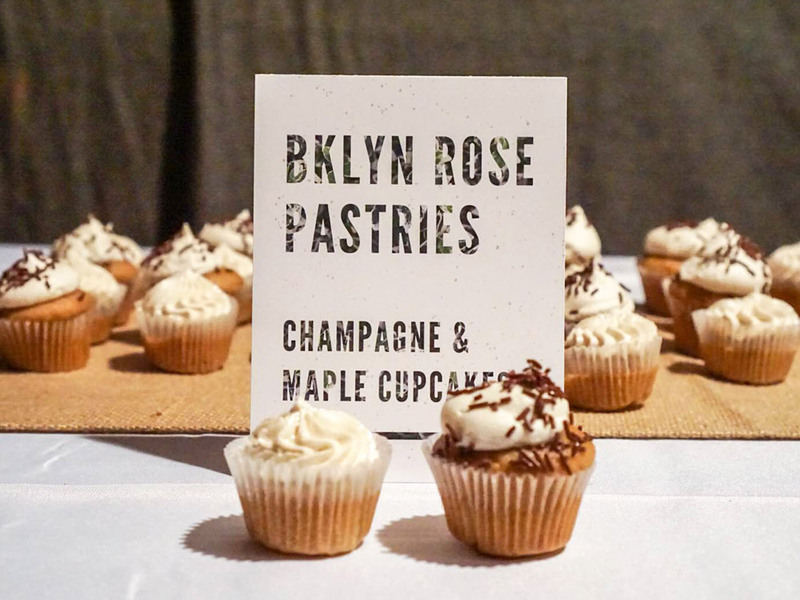 Brooklyn Rose Pastries made adorable champagne and maple cupcakes specially for the event. Since these are mini cupcakes, each one is just a few bites and you can enjoy both flavors without getting too full. One flavor was topped with sprinkles, and the other was topped with sparkles… you gotta have both to call it party! And that’s not all! 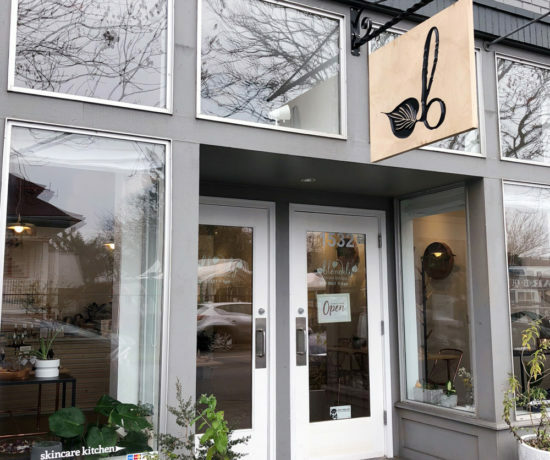 Our friends at May Wah Vegetarian Market filled our goodie bags with their addictive bacon jerky and teriyaki jerky and invited everyone to attend their 21st anniversary celebrations this weekend. Let’s Dutch also brought homemade vegan biscotti to tuck into our goodie bags too. 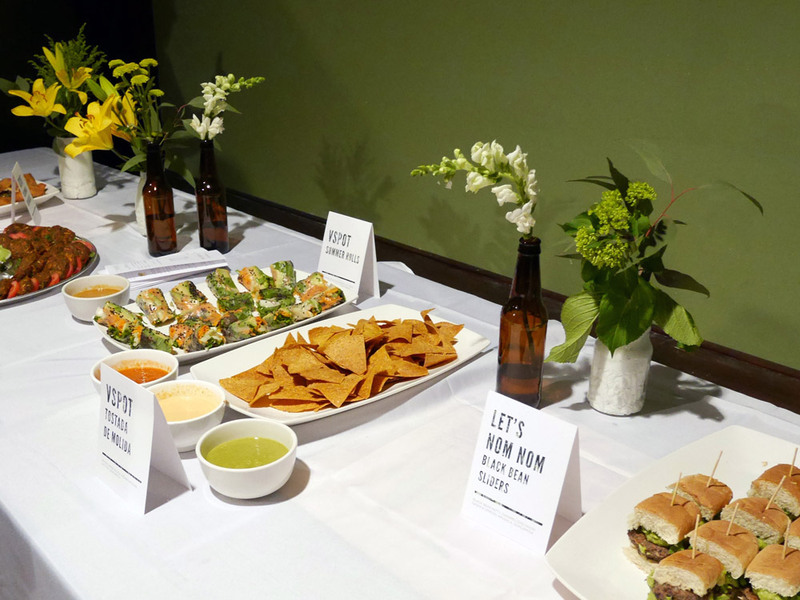 Everything at this event was made with love. In between all the mixing, mingling, and eating, I hope everyone had a chance to take a peek at our posters along the brick wall. They were there as a reminder about what Earth Day is all about and how veganism is the most effective way to stop climate change. You can view the full collection of posters here. Wow, you arranged all that? 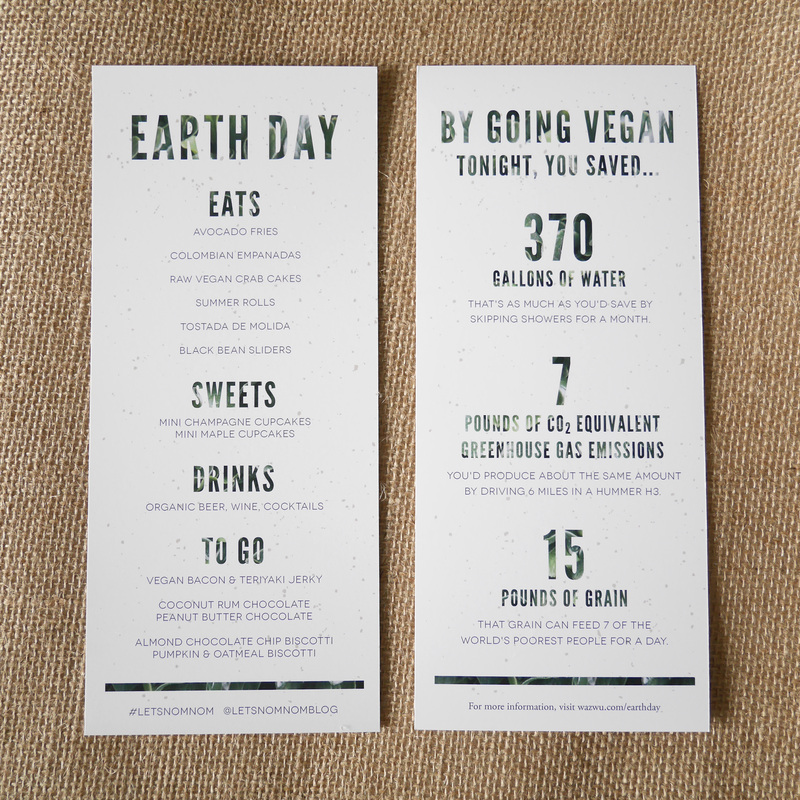 What a great initiative, and Happy Earth Day. I didn’t see any Earth Day events in Denmark, but in Dubai there were a few. 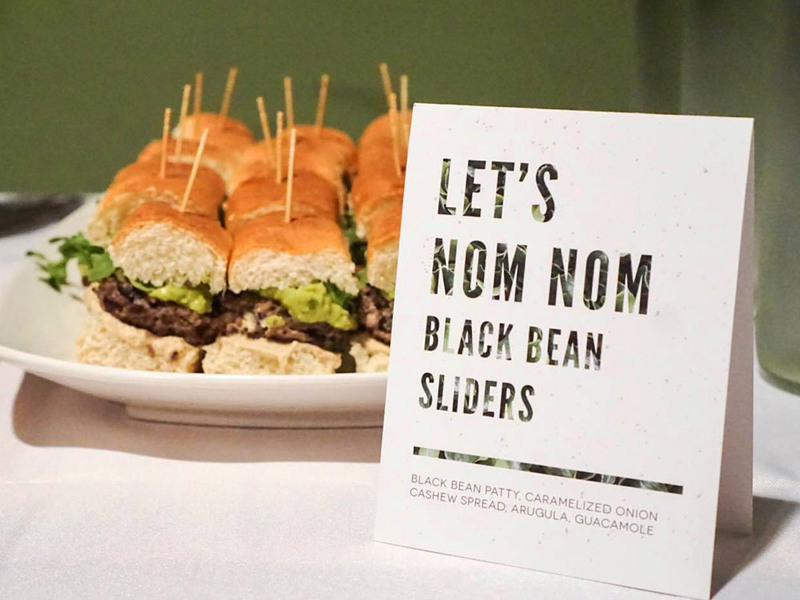 Your black bean sliders look delicious. Yes, I did! It’s a good project for my portfolio too. ;) That’s surprising. I would Denmark to be a place where Earth Day is really celebrated. 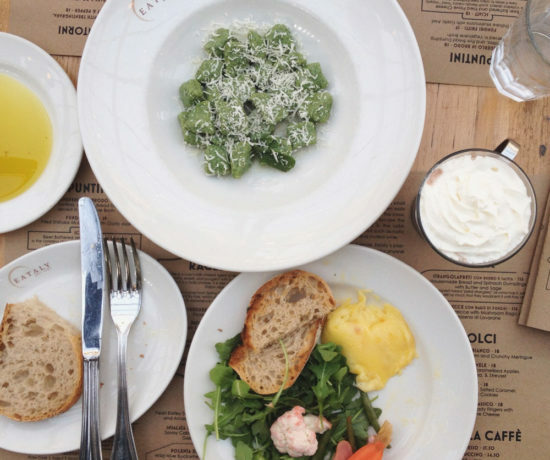 Telepan, Upper West Side – Let's Nom Nom! 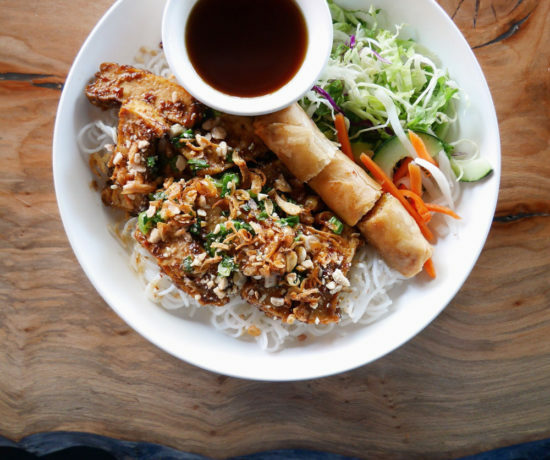 VSpot, East Village – Let's Nom Nom! 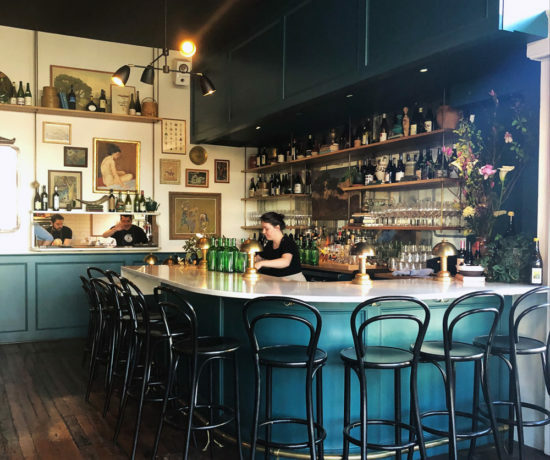 Mother of Pearl, East Village – Let's Nom Nom! 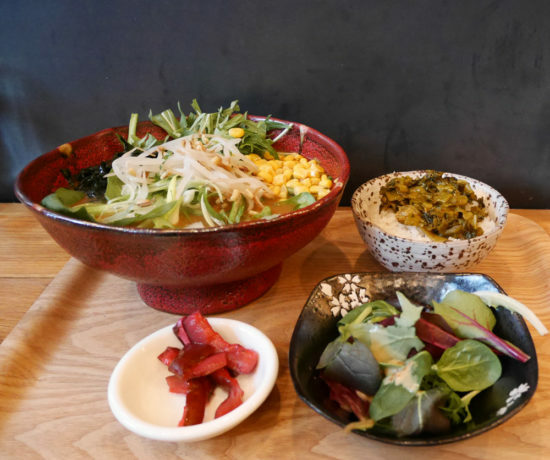 Rockin’ Raw, Greenwich Village – Let's Nom Nom! Best of 2016. Hello 2017! – Let's Nom Nom!